Kiambi lies in a prime location on the Lower Zambezi within the Chiawa Game Management area of the Zambezi Valley where the Zambezi River meets the Kafue River. 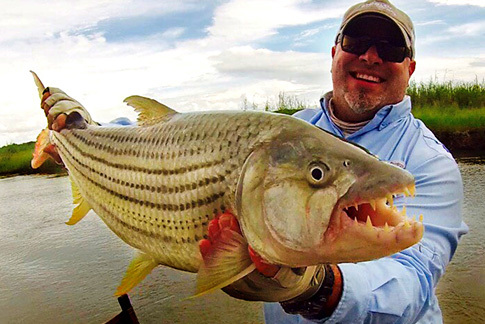 This package makes a tiger fishing trip to the lower Zambezi affordable at last! Watch the Kiami video now! Located at the confluence of the Zambezi and Kafue Rivers, Kiambi lies in a secluded area of the Chiawa Game Management area. 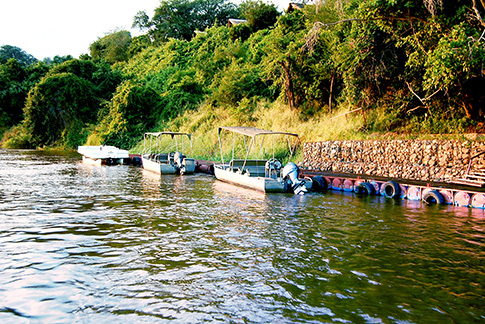 The lodge is easily reachable from Lusaka by vehicle so you will on the river and onto a tiger fish by the end of the day you arrive! This package includes accommodation the luxury thatched chalets. Each is set on a raised wooden platform, comfortably furnished with Zimbabwe teak furniture and are completed with private verandas that have views over the Zambezi. Additional in room facilities include a fully stocked bar fridge, tea and coffee facilities fans and with spacious en-suite facilities. The rooms can accommodate 3 single beds easily or 4 at a push. The pulse of the lodge is the main area which houses the dining, lounge and bar areas which all overlook the Zambezi. Guests have the choice of two lounge and bar areas - the lodge bar which is only open to lodge guests; and the campsite bar, which is open to all guests. This bar where you could sneak off to when there is an all-important news event or rugby match as it is air-conditioned and has DSTV satellite channels. The ideal time to fish for tigers around Kiambi is between September and April as the fish tend to feed more during the summer months. However don’t let this put you off; catching a tiger in winter is definitely do able - one must merely change tactics to suit prevailing conditions.